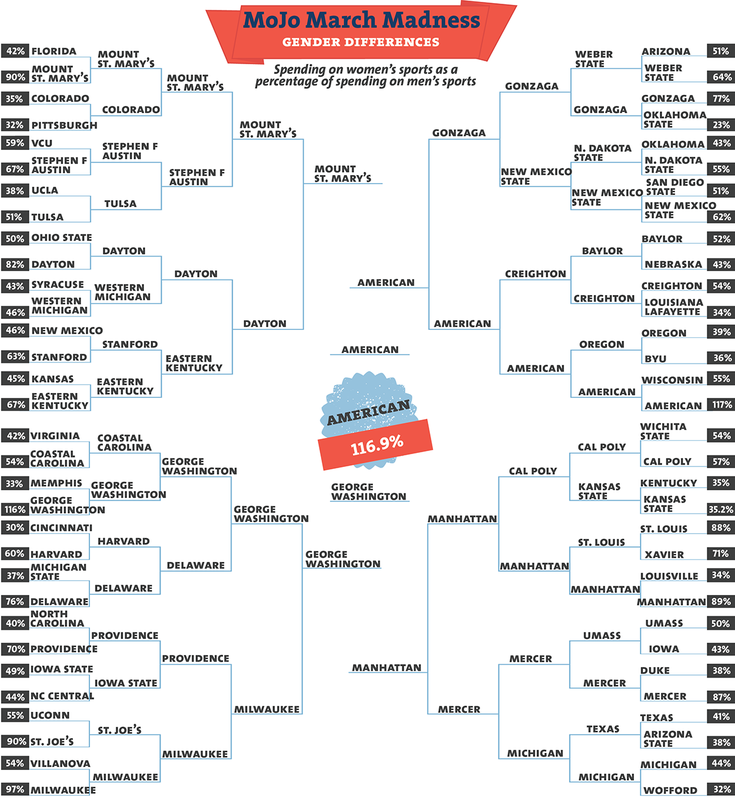 Imaginary Bracket: What If Spending More on Women’s Sports Meant NCAA Tourney Wins? While Title IX has brought more opportunities for women in college athletics, the money still flows primarily to the men’s side of things. Looking at women’s athletic funding as a percentage of men’s athletic funding punishes football schools in a big way, since football teams tend to cost much more than others, and no schools have a women’s football team. Among BCS schools, Stanford does best—women’s teams receive 63 percent of the funding that men’s teams get. Oklahoma State, where women’s teams receive less than 23 percent of the funding men’s teams do, lags well behind the rest of the pack. The championship game brings together two DC teams that both spend more on women’s athletics than men’s, with American winning out by a single percentage point. See what would happen if the richest teams won every tourney game. The Money Bracket: What If the Richest Team Won?